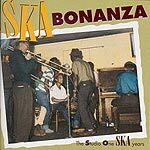 Continuing HeartBeat Records' (Rounder Records' reggae subsidiary) rereleases from the vaults of Jamaica's historic Studio One, "Ska Bonanza" is a generous two-CD compilation of early ska and reggae. Found here are early sides from the 1950s and '60s by bands and artists such as the Skatalites, Bob Marley and the Wailers, and Toots and the Maytals. Also found, of course, are many fine, talented acts that never hit it big in the United States. Ska and reggae grew out of the mento folk and calypso popular musics of Jamaica, combined with ideas drawn from the American R&B and rock'n'roll imported to the Caribbean island. Although taken from the original Studio One master tapes, the recording quality is uneven, reflective of the analog technology of the time. But even given scratchy sound and poor dynamic range, the recordings here remain as listenable as they are historic. This is good dance music 30 years after it was laid down; it is also accessible enough for casual listening. The album is accompanied by excellent liner notes  two sets, really  by both Julian Jingles and Chris Wilson that give the historic frame of reference for the then-developing new musical style, as well as biographical information on the artists. This release is an invaluable reference for fans of reggae and ska, as well as an inexpensive yet broad introduction to the music for the curious newcomer.